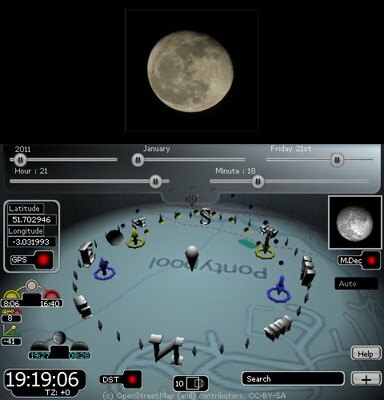 Find the Sun/Moon rise and Sun/Moon set of a given time and location, ShadowTrac will use the devices compass and GPS to display in 3D world the Sun and Moons current position. ShadowTrac will also show the shadow angle on the map so you can see the effect of the sun angle on shadows. *Scrolling map (or use GPS for location), the maps require an internet connection but they are a visual aid – the App will continue to run just fine without them. Turn off GPS and you can drag the location using the main screen. *3D View of elevation & azimuth plotted in real-time for the Sun and Moon times. 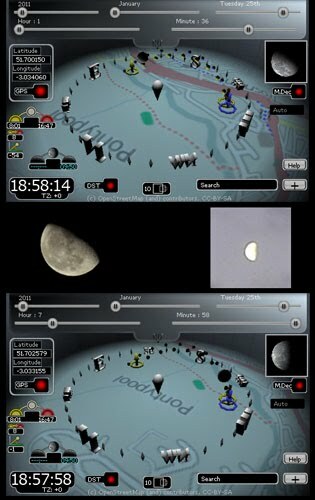 The Interface (3GS screen shots). * The Slider tab showing date and time sliders, when tapping this tab ( the 4 dashes ) switches from system time to input sliders. When the tab is up the app uses the current system time and time zone, also automatic Day light Savings work in this mode. When the slider is down you can slide them until the required date and time, automatic Day light Savings is not enabled in this mode though you can add it if you know if the current time-zone for the date is in DST you can enable DST using the box next to the clock. * The current moon phase render. * Magnetic Declination (angle between true magnetic north) in general this can stay on auto, but you can input your own angle here. * Help, launches browser and displays this page. * + icon, use this to import lat,long corrds from the clipboard. * DST Check box, while your not in system time mode (slider is down) you can manually enable DST by checking this box if you know for example if the current location should be in DST for the dates shown on the sliders. * System Clock, also shows Time Zone and DST applied. * Left to the Moon Icon, the current sun altitude. * Day Length, rounded to the nearest hour. * The Sun rise (left) and set (right) times icon. * Latitude/Longitude and GPS on or off. Then the main 3D compass elevation & azimuth plotted in real-time for the Sun and moon, also the icons for the sun rise and set (yellow) and moon (blue). The current shadow angle from the sun and the current map. 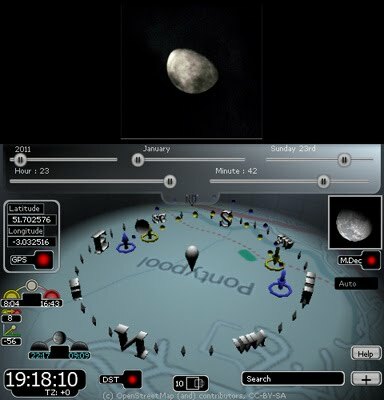 The current limitation with the moon is that it could look like at times the phase is slightly out, the slight problem is to do with the shading, the moon has a sharper line between light and dark were the app renders polys and they are quite large so the shading is spread over a larger area. For a future update I will write a more suitable shader. Also when comparing against a moon phase calendar they use same graphic until the next phase (then change the graphic), of course the phase through the cycle changes constantly, so ShadowTrac can give an better approximation as it leads into the next phase. The Sliders were moved to the times the photos were take at (6 hours or so apart for the one below), the images shows how the light angle changes. The images below shows the sharper edge between light and dark and how the app approximates it, again sliders moved to the times I took the image. texture mapis slightly to low on the model – noted for next update. In the below example (Android Motorola Defy Screen shot) I changed the system time to in April 2011 and eastern time zone, the app has added DST (displayed under clock) and the TimeZone reports -4 instead of -5. If the app is reporting the wrong time it’s more than likely it’s getting the wrong time zone from it’s database – if an email is sent to me with the lat/long I can add the location to the database. The App runs in landscape mode and currently requires the home button in the left hand. On Start up the App will show a spinning figure 8 as a reminder to calibrate the compass. The App will not bother you with the calibration screen icon after this.The App was designed for real-time use so everything is on display and control is through sliders. 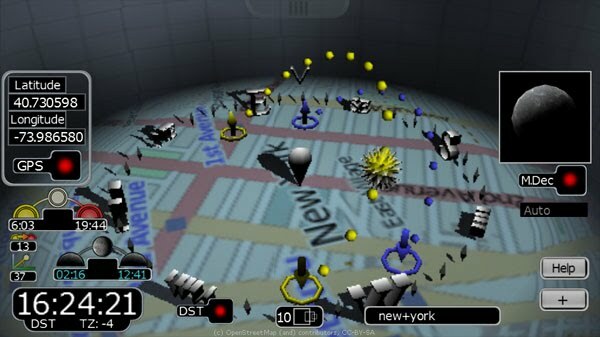 The Map, this updates via GPS or by dragging your finger in any direction, this map can also be zoomed in and out using the pinch. About the Map, if no internet connection is avaible this turns red – all downloading of new tiles run in the background the update of the map depends on the connection speed.